Time to pay up if you have a warrant out for your arrest. The 2015 Great Texas Warrant Roundup (is coming your way as some 300 jurisdictions across the state engage in this annual law enforcement campaign that begins Saturday, March 7, 2015. Neighboring jurisdictions joining this statewide initiative as regional participants include Harris, Galveston, Fort Bend, and Waller Counties. “We do everything possible to encourage individuals to resolve their court matters well before they become delinquent, but when all else fails, we turn to law enforcement to execute outstanding warrants,” said Director and Presiding Judge Barbara E. Hartle. “Participating in the statewide WRU program simultaneously with other jurisdictions helps bring about greater public awareness, which will hopefully encourage people to resolve their case or cases before they are arrested,” Judge Hartle explained. Houston Police will be assisted by the Texas Attorney General’s Fugitive Apprehension Unit to search for individuals with outstanding warrants. Once the Warrant Roundup period begins on March 7, 2015, HPD and other law enforcement agencies will aggressively target those defendants on the warrant list. Authorities warn that arrests can take place at any location, including the defendant’s home, school or workplace. Additionally, a special task force will focus solely on locating defendants with outstanding warrants through a License Plate Recognition program whose parked vehicle has been documented multiple times at specific locations. “The License Plate Recognition program has been in force since September of 2011 and has been extremely helpful in allowing us to locate scofflaws,” Judge Hartle said. Houston Municipal Courts offered an Amnesty Program in November 2014 to encourage individuals to clear delinquent court matters at considerable cost savings. At that time, certain cases in delinquent status were discounted by the dismissal of the Failure to Appear fine. The 2014 Amnesty Program assisted in clearing more than 9,000 outstanding Municipal Court warrants; however, there will be no amnesty offered during the Warrant Roundup period. Individuals are being urged to resolve cases to avoid arrest. Notices are being mailed to all Houston Municipal Court defendants with active warrants. Individuals with warrants in jurisdictions other than the City of Houston should contact those jurisdictions for information about how to clear outstanding warrants. All the Harris County constables and justices of the peace. Municipal courts in Alvin, Angleton, Deer Park, Dickinson, Friendswood, Houston, Kemah, La Marque, La Porte, League City, Seabrook, Taylor Lake Village, Texas City and Webster. A complete list of participating regional partners can be found at www.houstontx.gov/courts. For more information about Houston warrants or citations, visit the court’s website at www.houstontx.gov/courts or contact the Houston Helpline at 3-1-1 or 713-837-0311, if outside the City of Houston. To close cases for which all other means of resolution have been unsuccessful. Statewide cooperation with other entities provides broader public awareness. Tax refund season creates better opportunity for some defendants to have the ability to pay their fines. How many warrants are outstanding? This number is not constant and changes all the time. In the month of January, in the City of Houston alone, there was an average of about 300,000 active warrants in the court’s system. Some defendants have multiple warrants. How can I find out if I have warrants? 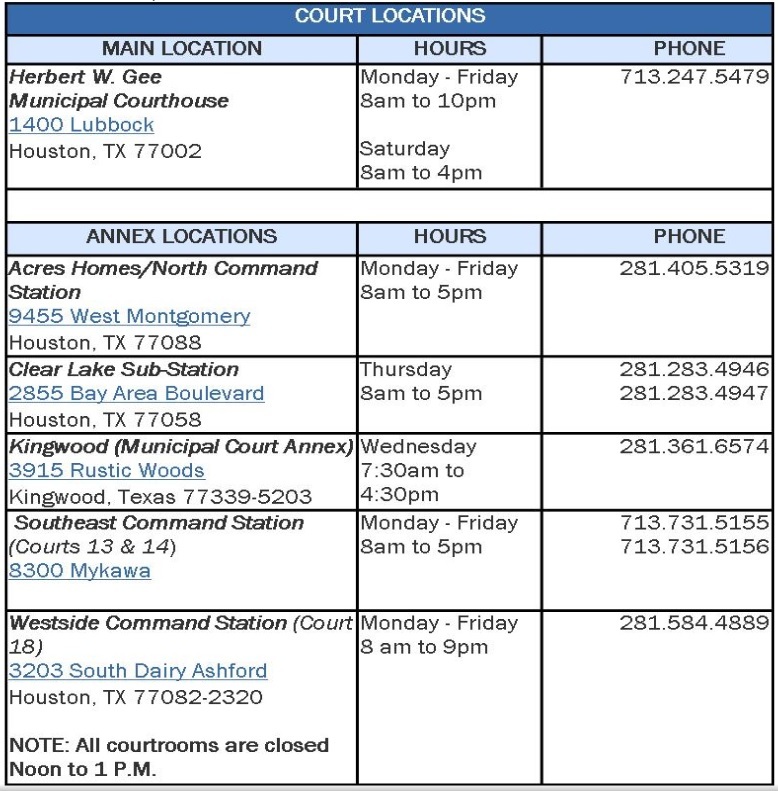 For Houston Municipal Court warrants, dial Houston’s Helpline at 3-1-1, visit the website at www.houstontx.gov/courts or visit any City of Houston Municipal Court location (see chart below). For information about warrants issued out of the Harris County Justice Courts, visit the Justice Court’s website at www.jp.hctx.net. For warrants issued out of surrounding municipal and justice courts, contact the Court in that particular jurisdiction for further information. What are my options if I find out I do have warrants? You may pay the fine and court costs, or post a bond and have your case(s) reset for a new court date. You may also seek legal advice from an attorney. If I come to court to pay, will I be arrested? No, defendants are encouraged to come in voluntarily to resolve cases during the Warrant Round-Up. Will there be an amnesty offered to reduce the cost of any of the fines or fees? We accept cash, checks, money orders, American Express, Discover, MasterCard and Visa. After I pay, how long will it take for the information to be removed from DPS records? The Department of Public Safety will clear holds on driver’s licenses within 7 to 10 business days. If I want to pay for my warrants, what are my payment options?